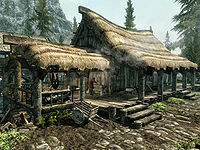 Alvor and Sigrid's House is a medium-sized home in Riverwood. It is home to the local blacksmith, Alvor, and his family. The building encompasses both the house and a smithing area outside and to the side of the house. The house consists of one area only, Alvor and Sigrid's House. 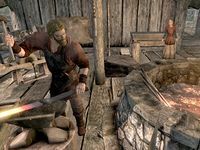 All the tools to make and temper weapons and armor are here, namely a forge, a grindstone, a tanning rack, and a workbench. There are five iron ingots and five steel ingots under the workbench. On the table by the tanning rack are some gauntlets, boots, a helmet, a steel shield, a steel dagger, an iron mace, and an ancient Nord helmet. Around the corner from the workbench is a display rack with an iron warhammer, and an iron sword. There are two floors to the house: the first floor and the cellar. They are split into areas discernible by the furniture, with the stairs to the cellar by the far left wall. The first floor is split into two areas: the bedroom and the kitchen. The bedroom contains two beds, two chairs by a table, a wardrobe, and a chest. The double bed is Alvor and Sigrid's, and the single bed is Dorthe's. There is a coin purse and some loose coins on the table, as well as a copy of A Gentleman's Guide to Whiterun. Next to this table is a cupboard, which has a blacksmith's apron on top. At the foot of the double bed is a chest containing leveled items. Stump can sometimes be found sleeping on the rug between the beds, after following Dorthe home. The other side of the room is a mix between a dining room and kitchen; by the fire is a cooking pot, and above the fire is a steel sword. Next to the fire is an iron shield, and three dead rabbits. Opposite the fire is a dining table with an Eidar cheese wedge, three pieces of bread, a snowberry, a bottle of wine and alto wine, a cabbage, two chicken eggs, a potato, and a piece of salmon steak. There is a basket next to the table with two leeks in it. Next to this is a cupboard containing sliced Eidar cheese, an Eidar cheese wedge, an Eidar cheese wheel, two leeks, three potatoes, and a single garlic. Hanging from the roof near this are two garlic braids, three elves ears, and a frost mirriam. The cellar is both a social and living area for the family, and a storage room for any extra weapons and armor that Alvor has made. Moving from the stairs there is a small table with a chair, a weapons table to the right, an L-shaped "bar", shelves behind the bar, a chair by an end table, and a wardrobe and chest by the far wall. On the weapons table are three iron arrows, and a hunting bow. On the woodpile next to the table is a woodcutter's axe. On top of the end table are two blacksmith's potions, while the chest has leveled items in it. There is a cupboard next to this, with an iron battleaxe on top of it. On the bar you can find iron gauntlets, an iron curiass, an iron dagger, an iron sword, a bottle of alto wine, and a pair of iron boots under the bar. Behind the bar is a cupboard containing clutter. Hanging under the stairs is a garlic braid, a dried frost mirriam, and a dried elves ear. There is also a small table containing a piece of bread. The front door has a novice-level lock. 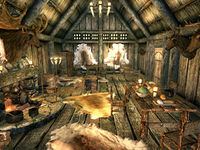 The house is locked most of the time, so it does not make a very good temporary home for the player despite Alvor's proffered hospitality. Furthermore, if you manage to get inside the house after midnight you are not welcome and may be told to leave. The key to the house is carried by Alvor, Sigrid, and Dorthe. This page was last modified on 21 July 2017, at 07:47.